In our modern, fast paced Western world, sleep has become somewhat of a luxury. Research has shown that every year, approximately 30-40% of Americans suffer from some form of sleep insomnia, a result of all sorts of physical, emotional and mental stressors. The fact remains that the average human needs around eight hours of good quality sleep every night for adequate rest and recovery, and growing teenagers need slightly more. However, the majority of us are not getting close to the recommendations, with most people averaging less than seven hours a night. In this article we’ll explore some of the most effective natural ways of upping your quality of sleep, but first, let’s take a look at why getting a good night’s rest is so important. Sleep is sometimes thought of as a state of laziness or inactivity, but that couldn’t be further from the truth. Thousands of physical and chemical processes occur whilst we rest, helping the body to rejuvenate. As well as allowing the body to recover, sleep enables the brain to process the events of the day and consolidate memories. It can also enhance the brains ability to solve complex problems, and help to boost creativity levels. Unfortunately due to our modern lifestyles – an amalgamation of late nights, shift work, traveling and stressful day jobs; most of rarely get to experience the benefits of being well rested, and instead are left to deal with the drawbacks of sleep deprivation. One of the most lethal of which is increased stress levels. Chronic stress that occurs over a prolonged time period can increase your risk of developing just about every nasty chronic disease known to man, including obesity, diabetes, heart disease and even certain cancers. 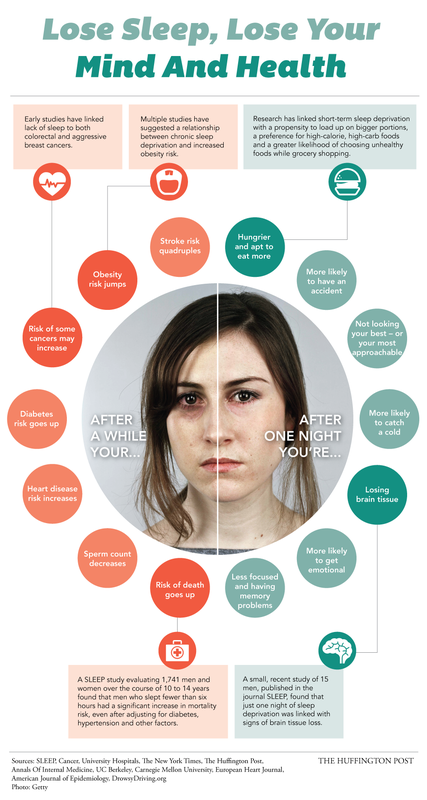 As you can see from the infographic above, a lack of sleep can also lead to memory problems, poor decision-making, and a whole host of other unpleasant issues that you’d rather not have to deal with. Even if you have suffered with sleep deprivation for as long as you can remember, it’s never too late to turn things around. Here are a few ideas that you can apply throughout the day, before you hit the hay, and even whilst you’re in bed; to help you naturally improve the quality of your sleep. If you’re looking for a good night’s rest, you might want to have your trainers and gym towel at the ready. Research has shown that exercise during the day can significantly improve your sleep quality. A 2010 study demonstrated that sedentary adults who introduced some form of aerobic exercise four times a week improved both their sleep quality and duration. Further research suggests that high intensity sessions may be even more effective than taking it easy (I know from personal experience that an intense gym session or martial arts class during the day makes me sleep like a baby at night). Just be careful not to exercise intensely too close to bedtime, as some find that it has the opposite effect and can keep you from settling down. Meditation is the process of slowing down amidst the hustle and bustle of everyday life. It’s about taking back control over your mind, and changing your relationship with your thoughts. As well as helping to reduce stress and improve decision-making skills, studies have shown that regular mediation can help you sleep for longer and enhance the quality of your sleep. With that in mind, be sure to set some time aside every morning or evening to sit quietly and focus on your breath. It doesn’t have to be for hours on end – just ten minutes is enough to have a marked difference. To get started, download the meditation app Headspace to get some friendly guidance, and challenge yourself to complete the free ten day program. The food you put in your mouth can significantly impact your sleep quality. Your best bet is to make sure to eat a wide variety of fresh, whole foods – plenty of fruits, veggies, whole grains, legumes, nuts and seeds. You can also choose to include specific foods that have been linked to better sleep. Foods such as bananas, figs and avocados contain the compound tryptophan, which is a precursor to melatonin, the natural sleep hormone. You can also take melatonin in supplement format, as well as other sleep aids such as Valerian, although evidence for their effectiveness is lacking. If you’re feeling tired after a poor night’s sleep, it can be pretty tempting to reach for the coffee to help you get through the day. However, this can be a vicious cycle, as too much caffeine can significantly reduce the quality of your sleep. As caffeine has a half-life of five hours, it may be wise to forgo it after lunch. Instead, reach for the water or herbal teas. It’s not always possible when you have evening commitments, it may be beneficial to stick to a regular bedtime regime. As suggested by Healthline, do your best to get to bed the same time each night, and get up at the same time each morning (even on your days off) to help your body get into a natural rhythm. Make a conscious effort to use the last few hours of your day to wind down and de-stress. There are a number of different ways you can do just that, so try a few and find what works for you. As Health Magazine point out, easy to perform Iyengar yoga inversions can help to improve blood flow to the head and ease racing thoughts. Some people swear by a warm bath to help them feel calm. Studies have indeed shown that a hot soak can help you fall asleep quicker, and improve your quality of sleep. Other relaxing activities include reading, drinking herbal tea, or journaling. Pick a few that you enjoy, and keep them up. Studies have shown that exposure to electrical lights in the evening can significantly hamper sleep quality. Bright lights trick your body into thinking it’s time to be awake and alert. If possible, install dimmer switches around your home and keep the lights down low come evening time. As Chris Kresser points out on his popular blog, the blue light emitted from our mobiles, TVs and laptops screens can suppress the sleep hormone melatonin, reducing sleep duration and quality. Thankfully there are a few you can get around this issue. The first is to enforce and electronic ban after a certain hour, and opt for one of the above activities instead. You could also make it a rule that no devices are allowed in the bedroom, training your mind to recognize it as a place of rest. Let’s face it; a complete ban may not be entirely realistic. If you must use your electronics in the evenings, do yourself a favour and turn down the screen brightness, or better still install the free software flux, which alters the colors to warmer, more sleep-suitable tones. Clean air may also help with the quality of your sleep. In the article, Martijn shares the below Ted Talk by Kamal Meattle on how you can oxygenate your home with a variety of plants, including Areca Palm, Mother In Law’s Tongue, and Money Plants. If your room temperature is too warm, it can interfere with your bodies natural temperature regulation system (which tends to dip in the early hours), leading to restlessness and reduced sleep quality. The National Sleep Foundation recommend keeping it at around 65 degrees or lower, either by opening a window or using fans. Before electricity and fancy televisions, there was a time in early human history when we lived with only the natural light provided by the sun (and perhaps the odd campfire). Our bodies adapted to this circadian rhythm, meaning that we sleep well in total darkness and are inclined to wake whenever we sense light. In modern day life this can cause a conundrum, as there are all sorts of artificial nigh time lights around, from streetlights and houses. The summer months can also mean longer periods of daylight in areas away from the equator, meaning it can be difficult to get an adequate amount of time with complete darkness. There are a few ways around this issue. The first inexpensive option is to buy an eye mask, or make your own with an old tie. If you want to get fancy, you could invest in blackout blinds to put your room into complete darkness. To wake your self up in the morning, it may be worth looking at a natural light alarm clock that mimics the rising sun. It may help you rise more naturally, and make you feel less groggy in the mornings. Our reaction to sound is another left over trait from our caveman days. A noise in the night could mean an approaching predator, so our bodies are naturally inclined to perk up and enter ‘fight or flight’ mode. Block out the noisy street and your partners snoring with a decent set of earplugs, or if you’d prefer to listen to calming music, consider splashing out on a set of sleep suitable headphones. Try listening to these relaxing sounds to help you sleep at night. Do you sleep like a soldier, or are you more of a belly down kind of person? Everyone has their favourite sleeping position. If you can’t seem to find one that fits you, experiment with these and pick your favorite. It is thought that lying on your back might be best for your posture and overall health, but do what feels right for you. Other things to consider are the tightness of your clothes (usually the looser the better), the firmness of your mattress, and the number of pillows. Even if you’ve had a sleep friendly day, carried out your evening routine, and perfected your sleeping environment, some times you’ll still struggle to nod off. Thankfully there are a few techniques you can use that may help. Some find that coming up with elaborate stories helps them to drift into dream land. Others find it useful to rewind their day (I rarely make it past my evening meal).